Vegetables have a host of health benefits. High in vitamins, minerals and fiber, they are critical to supporting optimal health. Although low in calories relative to other foods, vegetables contain a high percentage of carbohydrates, your body’s primary energy source. Like most foods, vegetables contain a mixture of the three major calorie types. However, unlike animal products, such as meat and cheese, which derive a large portion of their calories from fat and protein, most vegetables are made up of mostly carbohydrate. Starchier vegetables, including potatoes and squash, contain more carbohydrate per serving than green vegetables, which are higher in protein. Carbohydrates are classified by the sugars they contain. Simple sugars, such as glucose and fructose, are sweet tasting, as are disaccharides. These sugar pairs include sucrose, or table sugar. Sucrose consists of equal parts glucose and fructose. Longer chains of sugars are called polysaccharides, or starch. In contrast to simple sugars, starch does not have a sweet taste. The carbohydrates in most vegetables consist of glucose, fructose and sucrose, while potatoes and squash are higher in starch. The fructose and glucose in vegetables are free-form, and they do not require the work of digestive enzymes to break them down. Therefore, they rapidly enter your bloodstream, where they travel to the cells of your body for use as energy. By contrast, starchier vegetables require an abundance of the digestive enzyme amylase to break them down, in addition to other enzymes. 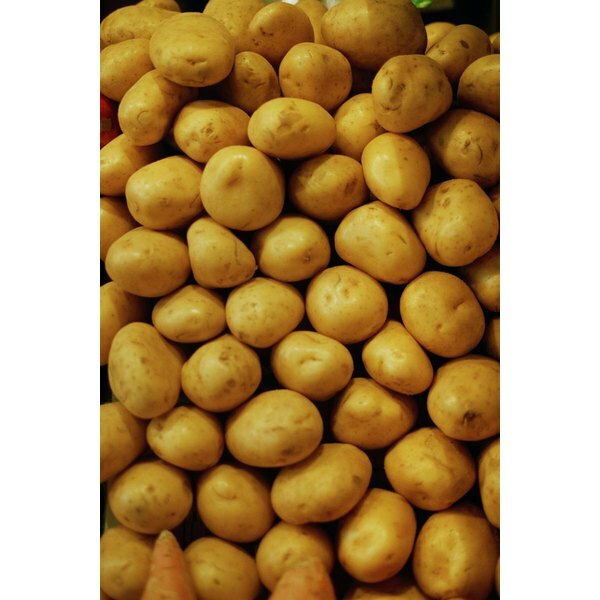 Consequently, the energy potatoes provide may not be as immediate as that offered by, say, carrots, but the slower-digested starch provides sustained energy levels. Why Is Cayenne Pepper Good for You? How Many Calories Are in Tomato Juice?